The word truc in French means "things". In Italian, I have no idea. I've been learning a lot of French here at the Monnoyer home because the grandparents are visiting from Nice, France. I thought I'd take a break from talking about winemaking and tell you a little about the things I'm glad I have here. My head lamp has been so useful in the cantina, looking into barrels, through bottles, and in the house as well to find toys under furniture. They loved my head lamp so much PJ even got one for himself! Leggings have been a must! I wear them every day and the extra layer has saved me from freezing! A good pair of sharp scissors are great to travel with! My grey fleece is literally a second skin. I wear it all the time, every day, and am so happy to have it in the house, in the field, in the cantina, etc. Sunglasses have been good protection from the sun, but more importantly they have served as "safety glasses" from flying vines and olive branches! I've been thinking of Safety Sandy and how she would be so proud of my safe work habits. My iPod Nano is now my best friend. I listen to it every day while working. It goes with me in my pocket everywhere I go and when I have a few minutes alone to wait or while working, I am listening to great songs that were given to me by friends before I left. Feels like I have my friends with me whenever I want. Mary Kay Satin Hands! I brought the hand lotion and the thick overnight moisturizing "paste" and I am soooo in love with it! My hands are getting a good workout every day and they feel incredibly pampered when I use this on them at night. It was a last minute luxury item I threw in but now I am so happy I did- it's more of a necessity here! #1- Rubber Boots! I sink into mud that goes nearly up to my calves. I bought a pair of rubber boots that I can tuck my pant legs into and now I am good to go. They do nothing to keep my feet warm, but they do keep them clean and dry. #2- Leather work gloves. A must have!! #3- Cell phone. I bought the cheapest cell phone that is made here. I love it! It's my watch, my alarm clock & calculator. It's very handy and weights maybe 2 oz! It's no iPhone by any means, but it's all I need here. 1. The higher up on the hill, the better. The higher you are the less chance of being caught in the fog that is here and you will also get less run off from everyone else (chemicals, sewage, etc.). 2. Dry- the less water the better! 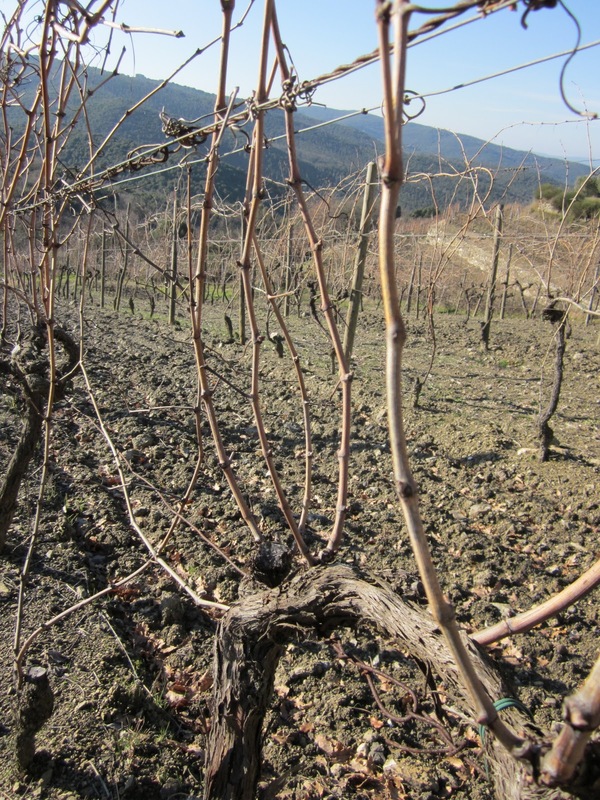 Vines do best when stressed to find water and need to dig deep in the earth. 3. Slate/clay/dry soil- if it has a lot of nutrients it will produce poor grapes but good veggies. Look for grey colored earth, not brown. Diseased vines can contaminate others- sheers should be designated for cutting either diseased or healthy vines but not both. If needed for both, clean with alcohol in between uses. Don’t prune when it is really cold out- if the frost hits the pruned vine, it will freeze it and damage the vine. Only make cuts when it is warm enough outside. Be gentle to the newly cut vines. It can damage the vine if it is battered and bruised. Don’t clean your muddy boots on a vine- the diseases in the mud are now directly on the vine and could more easily contaminate the vine now. Willow branches to tie vines to the wires between posts. They use these instead of plastic ties because they are organic, better for the earth, stronger and easier to cut. Less waste. Two Bud vine growing technique: The vine grows up and then splits into two on the wire. This allows the sap and nutrients to go in multiple directions, thus creating an equilibrium on the vine- all grapes receive the same nutrients and are more consistent in quality. Sap runs up for a few months and then down for a few months and will take the good or bad from the soil with it. There are lots of small spiders who live in the dead vines. They like to fall on you (along with the dirt) when you take the dead vines off. Every day I come in and shower immediately because I know there have been little spiders crawling on me all day long. Lovely. I am allergic to Tuscany! I forgot that I have bad environmental allergies- I’m allergic to dust, mold, and other stuff that is all around here! I’m a sneezy mess most days. Oops. Cold earth + Rain and Fog = Freezing cold feet in rubber boots all day. My feet are constantly cold and take a few hours to defrost once I get back inside. Love the hot showers here! The temperature in the cellar was around 50F so I was wearing 4 layers which included a rain jacket, fleece, hat, gloves, 2 pairs of pants, etc. And I was still cold! 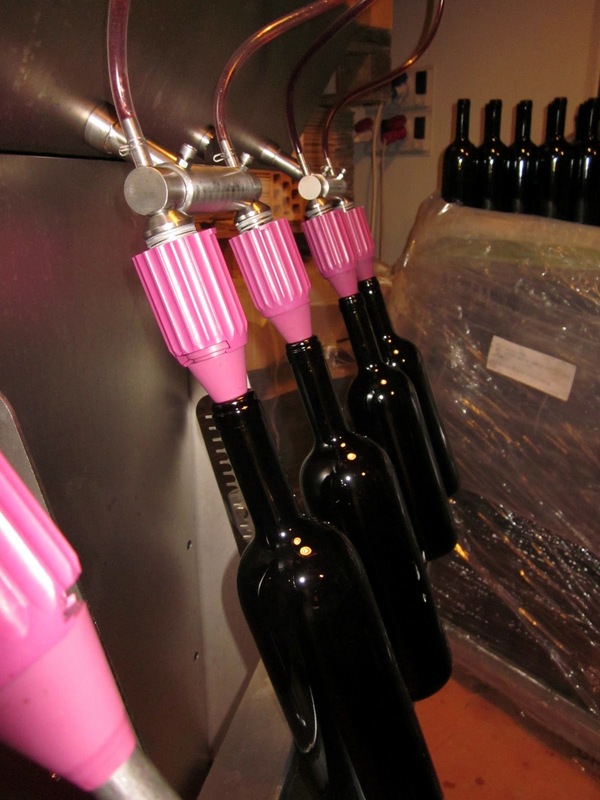 To transfer the wine, attach a clean hose to wine tank, then to filter, then to the pump, then to the bottling unit. Filter must have no pieces of plastic, paper, or other stuff in water or it will catch when cleaning. Our filter caught approximately 6-7 fruit flies from inside the tanks during our bottling! Eeeww. All items must be clean and dry! Everything that touches the wine was cleaned with alcohol, citric acid and caustic soda. The filling unit can fill 6 bottles at once. The spout will automatically stop when filled to the right level because it equalizes and will not go higher. 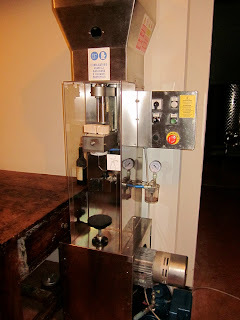 Bottles will stand “upright” for 4-5 days to allow air to escape and wine to settle. Then they will be placed on their side for another 4 months before being sold. I have officially introduced my hummus to Italy. However, the Tuscan version is the best I've ever made. It was so creamy and really delicious. Served on cut red bell peppers and carrots that were so crisp and fresh you could feel the water bursting out of them as you took each bite. Check out the modifications to my classic recipe ... now enjoyed all over the world! There have been many surprises here in Tuscany. Country living is not something I am accustomed to even though I love to be outside. 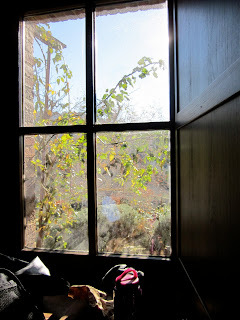 Below you will find some of the interesting things I have discovered about living in the country in Montalcino! The sunsets here are nothing short of breath taking. Between 4:30-4:45pm you want to be high on a hilltop so you can see the magic unfold before you. As the sun sets, it blankets the rolling hills in a warm pink hue. It reminds me of the sunrise on the Front Range in Colorado Springs and I get the same awe-inspiring feeling from watching it. I try to make it a daily occurrence, when it is not foggy. Also the land itself is beautiful, especially in the winter months. Ironically, it is lush and green in the winter (due to all the fog) and dry and earthy/sandy in the summer. They cut all the grass in the summer, leaving the earth bare. People take the time to talk to each other, spend time together and they are not rushing to fit life in. Instead they let life happen and then work around it. Recycling is easy! There is even a battery recycling box at the checkout line at the grocery store. Everyone recycles...everything! Food packages are designed with easy recycling in mind. There is little waste and lots of composting that also happens. The food in Tuscany in general is purely sublime. The only exception is the bread. I know this sounds crazy but they really don't do bread well here. In Tuscany the bread is not fabulous (due mostly to lack of using salt) but in Montalcino especially, it is downright bad. Crumbly and dry with little flavor, I prefer to stick with just some cheese instead. Go figure! Just to give you an idea of how bad it is, even the dog here will not eat it. She will only eat French bread. In a cool and VERY moist environment there are "critters" of all kinds. Spiders are extremely common. I have found a few in my bedroom, one was dropping in on us in the car today (literally), one was perched on an olive branch that I was reaching for and another was on the bag of potatoes near the sink this evening. I really don't mind spiders (unlike my sister who would be throwing her shoes at them all the time) but I do like to know when they are around. What I do "mind" are snakes. Terrified is a more accurate term. And there are many of those here too. Saw my first one yesterday... "just" a grey garden snake. Apparently these are the good kind because they eat mice. YES, my worst nightmare of rodents is here too! But back to the snakes. The "bad" ones are the vipers! You really don't want to be bitten by a viper because they have poisonous venom that will go directly to your heart and cause you to die very quickly. I need to be on the look out for short brown vipers. Seriously? Mud, mud, mud everywhere. It is so humid and moist here due to the fog. The ground is over-saturated in the winter, making it muddy and dewy for most of the day. The earth never really dries out. So this means that my shoes are constantly packed with muddy soles and I never have a solid grip on the ground. I think I will invest in a pair of rubber boots that go up to my knees! 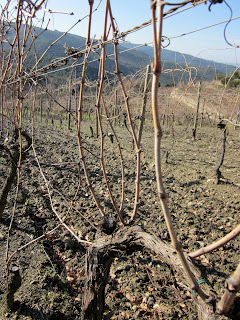 This is one of the Casa Raia vineyards, looking dry and warm. Don't let it fool you! It is all mud!! I am obsessed with pici. When I was in Siena last summer, I had dreams about this pasta and HAD TO HAVE MORE! I brought it home and made it for a few friends in Colorado and also for my family before heading back to Italy this time. I have sought out WWOOF Farms that mentioned pici production. I LOVE this stuff! (In Italian I would say, “adoro i pici”). So when Kalyna mentioned that there was a day dedicated to pici, it was a dream come true for me. Saturday, January 15, 2011 was a beautiful day in Montalcino and it was the day I learned how to roll pici like an Italian (kinda). First, a little info on this glorious pasta. It is somewhat like very thick spaghetti. It takes 22-23 minutes to cook the dried variety. It comes from the Siena region of Tuscany and is nearly impossible to find in the US. In Montalcino, it is called “Pinci” because they add eggs and a bit of salt to the dough. This addition makes the dough softer. I assume they only add the salt to the cooking water. In the town of Siena, it is called “Pici” (with no “N”). 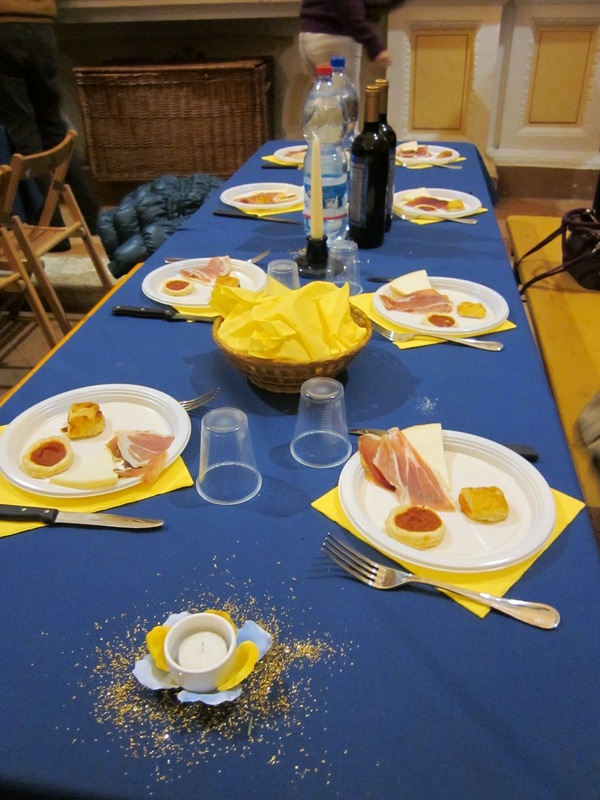 In Siena, it is only made with farina (flour) and water… no eggs! So, back to the rolling…. 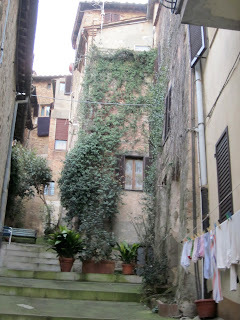 Kalyna, the kiddos and I went to Montalcino to one of the old churches and met up with the women of Montalcino. It was a room of mass pinci rolling! Knead the dough and let it rest a bit. Roll it out to approximately ¼ inch thick. Cut it into approximately 1 inch thick strips. On a floured cutting board, start rolling, using only the palm & heel of your hand. Don’t be afraid to apply pressure or to add a little moisture to your hands so you can get some grip on the pasta. As you roll, slightly stretch the pasta strip with the other hand. Deposit the beautiful little worm-like creations onto a tray that contained finely ground cornmeal. Wrap the pinci into individual nests like you would a garden hose. So as if that wasn’t life-changing enough, there was also a town dinner that night that featured the pinci. Everyone was invited to attend. For 20 euro, you got an antipasta dish, 6 courses of pinci with all of the traditional sauces, a meat & vegetable course, tiramisu and flowing vino and aqua. What could be better? Kalyna, Eliah and I found a perfect spot between a family and two men, both named Claudio. The dinner started at 8pm and we didn’t leave until nearly midnight! And that was when it was turning into a discotheque! Below you will see each of the courses and the sauces explained. It was a heavenly experience! Talk about carb overload of the gourmet kind! Sulfites must be added by law to all wines in Italy. You must add them in order to clarify the wine and also, and most importantly, to prevent bacteria from growing. Most people will add around 10 g per hectaliter, sometimes even up to 30 g. Casa Raia only adds between 2-6g, basically the minimum. It is a chemical and the more natural you can go, the better. The more you add, the more biting the flavor and trust me, you can taste it. Sulfites, as well as tartaric acid will combine with tannins in the wine and drop to the bottom, creating sediment. Sediment is a beautiful purple sludge that collects at the bottom of the wine container. It actually feels like a cream and is apparently really good for your skin. I think they should figure out a way to sell this stuff to cosmetic companies. Maybe winemakers already do. Wine must be analyzed before bottling to ensure it meets minimum requirements and also so the vintner knows what to put on the label. The wine will be analyzed to determine the alcohol content, sulfite level, acid level, sugar level, etc. If a sulfite level is too low, you can add more. If an acid level is too low, you can add tartaric acid to increase it. This will cause a different taste and more sediment. It is better to pick the grapes when the acidity level is most desirable and avoid having to adjust later in the fermentation process. Same idea with the sugar level. 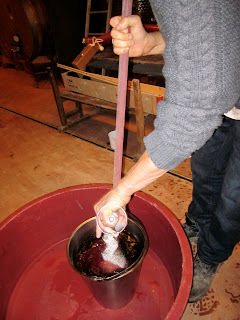 The name of the game in wine making is clean, clean, clean! Any wine left anywhere in the cellar, on the barrels, etc. is exposed to humid, cool air and is the ideal breading ground for bacteria. 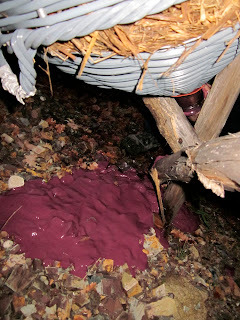 Thus most of your time in the cellar is spent cleaning up wine spills and dribbles. There are two ways oxygen can harm a wine… too much exposure and too little exposure. Both cause an off flavor. You can fix “too little exposure” by transferring the wine to another container and allowing it to have more exposure to air. If it has already had too much exposure, then you can’t fix it. Air tight seals are the key to success, especially in stainless steel containers. There is a band of rubber that surrounds the lid and you pump it full of air once it is placed on top of the wine. This ensures that it is sealed and has resistance, thus not allowing any air exposure. Gravity is your friend when transferring wine. Any tube can be used, but place the item to be poured higher than the item that is being poured in. Must be 100% Sangiovese grapes (same grape used to make Chianti but in a different region). Must be barrel aged for a minimum of 4 years and 4 months in the bottle before being able to be released for sale. 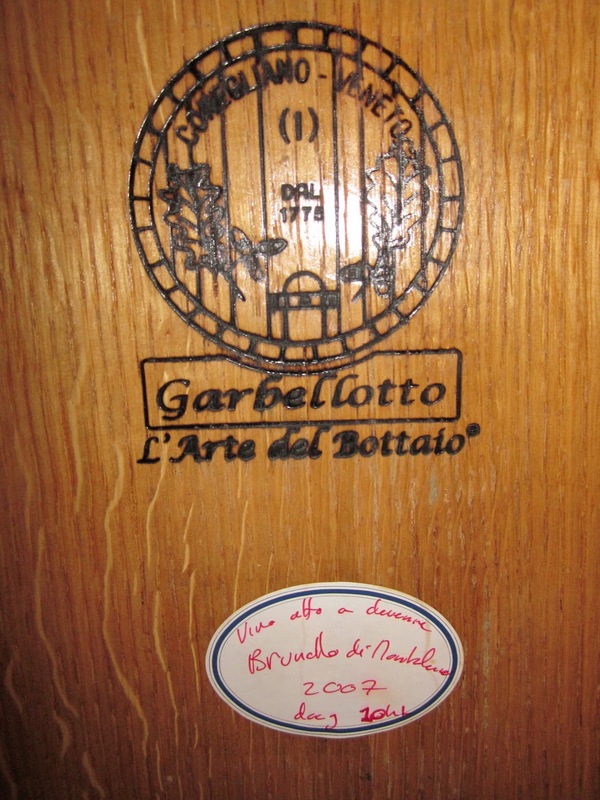 Before selling, the wine must be “tasted” by the Brunello official panel. 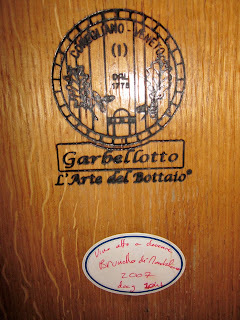 If the wine does not have the right characteristics of Brunello, they will deny it’s naming and will "demote" it to a Rosso di Montalcino or an IGT wine (Indicatione Geographica Typica). There are 300 producers of Brunello in Montalcino. Of those 300, only 9 are organic producers. (I am on one of those organic vineyards). The cork used for Brunello should be of the highest quality, meaning that it is a bit longer than usual and much more dense. The ones here at my vineyard cost approximately $1.10 each. 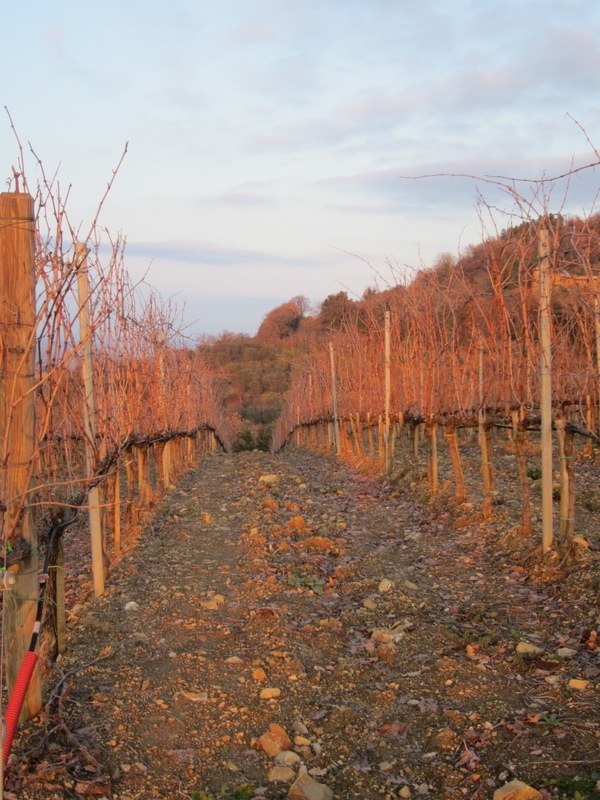 Sangiovese grape is susceptible to mold diseases which are easy to get here in Montalcino due to the intense and constant fog for 6 months out of the year. It’s not glamorous and it is hard work, but I loved being a very small part of creating this wine and olive oil. My first day had me washing out bins. 82 of them to be exact. I was to unload, wash, rinse, dry, stack, carry and reload in the shed (approximately 100 yards away) 82 bins used for collecting grapes and olives. This may sound simple, but it is back-breaking and took me FOREVER! Seriously, it took me nearly 5 hours to do this. I was alone though so I do have that in my favor. Listened to my iPod all day while working in the sunshine, overlooking the terraced Tuscan hillsides. It was a good day. I slept very well! And dinner was Osso Bucco with local 2003 Brunello di Montalcino (from the neighbor)!! Another 35 bins to wash out this morning. This time I got to use the heated power washer. Yeah baby! This also means that I was soaked. Wearing jeans and a fleece and my gortex Keens (wet shoes but dry feet), I tried to avoid the back spray, but was not very successful. It was also a cold and foggy day here. It is often foggy lower in the valley, but we are higher up so it doesn’t happen as much here. Today, it was foggy everywhere. And the earth is always muddy in the morning- a lot of moisture and dew here. This is “good” for the grapes. By “good” I mean that water is good, but fog frequently causes mold diseases in Sangiovese grapes, which is not good. 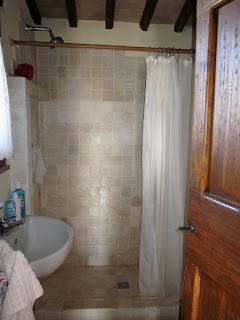 The second part of my day was much more interesting (warmer and dryer too as I took a hot shower and changed at lunch). We got the bottling room ready for the big event- next week we will be bottling 2006 Brunello di Montalcino! WOOHOO!! When using new barriques, the wine will “breathe” less as the wood is newer and sealed better, thus there will be less loss. 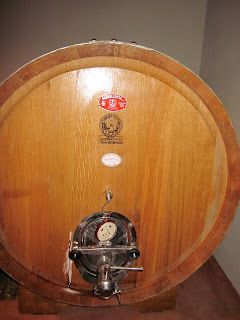 Older barriques (2+ years) will have more loss. You need to check the level of the wine once a week in the first 2 months after putting into the barrique. If it is not touching the top, refill with the same wine that is kept on reserve in a stainless steel (airtight) vat in the same temperature and humidity controlled room. Fill to the top. For the next 4 years, you can check the level once each month (or more often if you desire). Everything must be clean :) No wine drips on the outside of the barrique, or on the floor. All toppers must be cleaned and dry before replacing. No water in the wine! And this is the view of Montalcino (up on the hill) from my private entrance!!! I got showered, dressed and went to the kitchen, just in time for a lovely “easy” Tuscan lunch. Spaghetti with warmed ricotta cheese, grated lemon rind, salt and pepper. Delicious! Simple, yet perfect! We all loaded in the car and drove the whole 1 mile UP THE HILL to town. 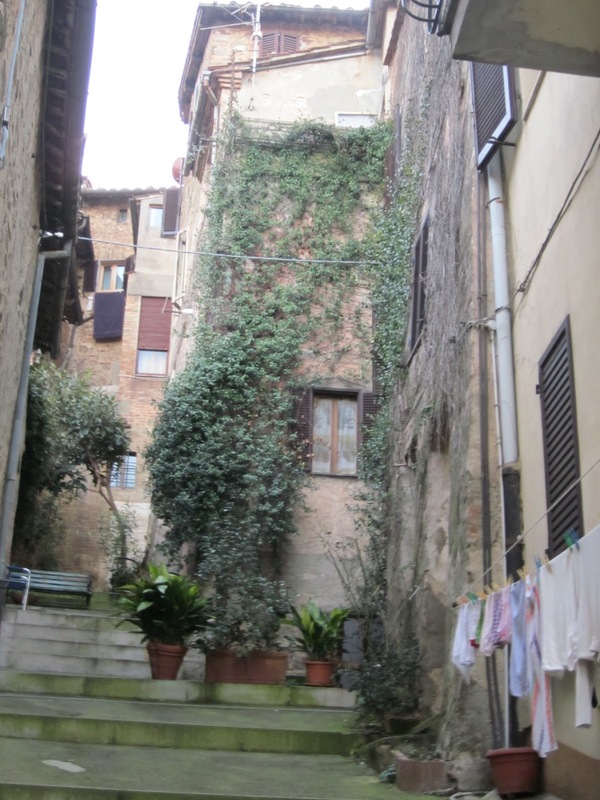 I wandered (limped actually- I sliced a chunk out of my toe the night before I left) around the empty streets of Montalcino while they visited with friends. It was cold and I was glad to have my gloves, scarf, fleece and long sleeve wool shirt. I found some of the same shops and enotecas (wine bars/tasting rooms) that Ryan and I had visited nearly 2 years ago. Bought some Pecorino and bread and ate them in a park while watching the sunset over the Tuscan horizon. Love it. On January 11, 2011 (1-11-11) I arrived in Italy! My passport was actually stamped in the Paris airport (bummer) but it does say 1-11-11 J My job is to now take in all of the Italian food, vino and culture I can stand in the next 89 days! My backpack was delayed in arriving to Florence by 3 hours, so I waited patiently…what else did I have to do? J I felt a little like Tom Hanks in “Terminal”, where he is stuck in the airport for a few weeks (or months?) because his passport isn’t valid. I kept seeing new people get their luggage, meet up with tour groups or friends and then exit the airport, while I just stayed there. My backpack finally arrived and I was fully loaded with all 65 pounds of my “light travel” essentials. Took the shuttle to Santa Maria Novella train station and bought a ticket to Buonconvento via a transfer in Siena. Before leaving the station I bought a pizza margarita and a split of Tuscan red wine for the road! This is the beautiful thing about Italy and riding the train, you don’t have to drive! And you can drink discretely while on public transportation. Safely arrived to Buonconvento where I was to call my host and ask him to pick me up. A seemingly easy task when one has a cell phone with an Italian calling plan or if the pay phone worked. Key word ... “IF”… the payphone worked. But it did not, so after getting an Italian girl to verify that the phone was broken, she directed me to another pay phone. I ended up in a small grocery store and there were 3 Italian ladies being, well, Italian, complete with large hand gestures, loud talking and very serious looks. I gave them my best “I’m a helpless American girl and don’t speak Italian, but could you please help me” smile and mustered up the best of my “grammatically lazy” Italian to ask if they could help me make the call. One of the ladies took pity on me and offered to call for me on her cell phone! Bingo! 30 minutes later Pierre-Jean (yes, he’s French) was there to pick me up and away we went, zipping along the dark, NARROW, windy roads back to the house. I was met by Kalyna (Italian-Canadian wife), Eliah (3 yrs) and Noah (1 yr) who had just flown back from 3 weeks in Canada the day before. We were all a jet-lagged bunch! Dinner was a beautifully roasted bone-in rack of pork (pork chops? Not sure how to call this), and roasted potatoes drizzled with house-pressed olive oil and freshly cut rosemary! Seriously. Amazing! I couldn’t get to bed fast enough, and a bed in my own room with my own bathroom no less! I had been up for 33+ hours. SLEEP! This is a small vineyard and olive grove that produces strictly organic Brunello di Montalcino and Extra Virgin Olive Oil. They also produce Rosso di Montalcino and an IGT red wine of Tuscany. All pruning, planning, and harvesting is done by hand. They are 1 mile from the town of Montalcino and you can see the town from their home! The family is a French husband, an Italian-Canadian wife and 2 kids (ages 1 & 3). 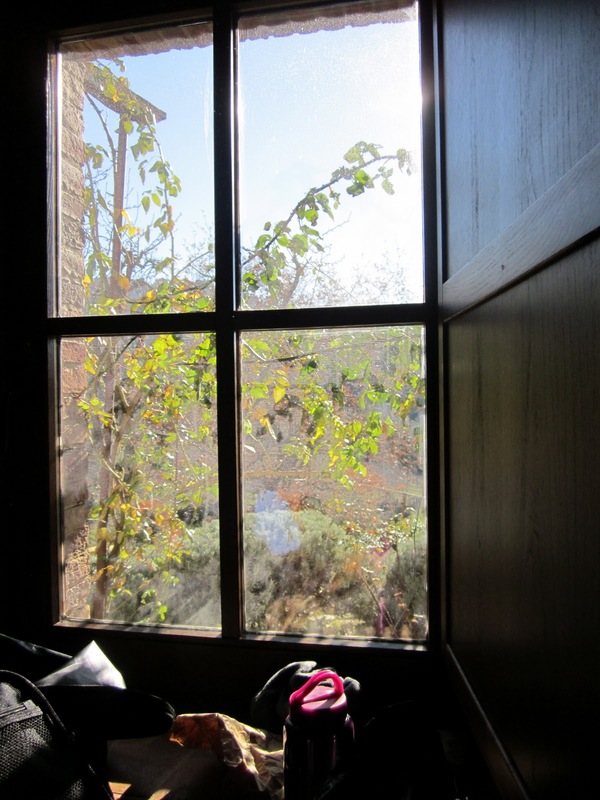 I have my own room & bathroom in a beautiful Tuscan villa that is surrounded by olive trees and vines. 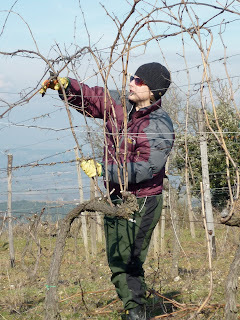 My job is to help with whatever is needed from pruning vines and olive trees to helping bottle the Brunello di Montalcino (2006)! This farm specializes in single grove pressed olive oils. This means that each grove grows a different olive tree and each grove is pressed separately, creating artisan Tuscan EVOO. This farm is also experimenting with lavender oil, faro, Italian kamut and herbs. They are planning an organic vineyard this fall. They are located south of Montepulciano, near the border with Umbria. The family is British and Italian and has 2 kids (ages 4 & 12). I will have my own room and bathroom. They have also co-founded a local CSA (Community Sustainable Agriculture) group and are involved with Italy’s Slow Food Movement. In addition, they export their olive oil to farmer’s markets in London. My job is to help with whatever is needed, from pruning olive trees and farm maintenance to indoor activities like marketing and helping with promo materials. Florence, Pisa, Cinque Terre, San Gimignano, Siena, and the wine country of Tuscany! 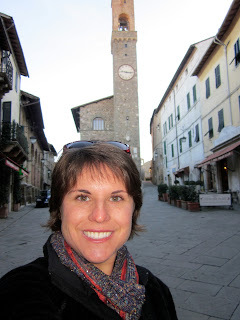 I will be touring my cousin Jennifer and her husband Bill all around Tuscany for a week. The want to see all that this region has to offer in terms of culture, wine and food! I can’t wait!! This farm is located on top of a hill that has a 360 degree view of the Arno river valley…beautiful! They make organic Chianti wine and extra virgin olive oil. My responsibility will be to help in the vineyard, olive grove, perhaps in the vegetable garden and to learn as much as I can about wine-making. They are located between Florence, Arezzo and Siena- a perfect location for my last farm! High-speed train gets me to Florence in 20 minutes. I will have my own room and bathroom in one of the houses on the property! Even though these farms all have websites, I would encourage you to also google them to get more info on what they look like, and offer. Although my Italian teacher would not be pleased, I am happy to say that all farms speak fluent English! I did bring my RosettaStone and plan to use it nightly… starting tomorrow. So this is the plan… for now. But who knows what may happen with a hotel, a winery, or … ?